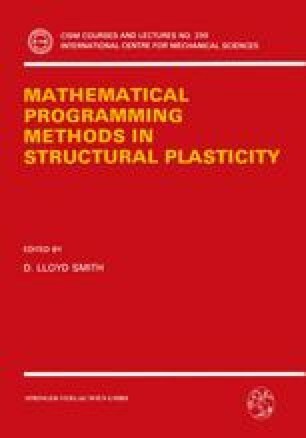 Plastic limit design entails the designing of a structure so that it will just reach the limit state of plastic collapse under prescribed design loads, and, in addition, so that some design objective, often relating to weight or cost, is optimally achieved. When the geometry of the structure is fixed a priori, the design loading is known with complete precision and the objective function is linear, the problem can be expressed as one of linear programming. In this chapter, the effect of uncertainty in the design loading is considered. Where the quality of the data is insufficient to represent the loading through a probability distribution, a simpler approach using fuzzy linear programming may be employed. This involves only a slight increase in the computational effort over that required when the loads are precisely defined. Two methods are described. In the first, the (possibly) several objective functions are recast as fuzzy goals and appended to the constraint set. The maximal value of the grade of membership of the design decision may be regarded as a measure of the degree of acceptablility of that decision in the face of uncertainty. In the second method, the original (single) objective function is retained, and an extra constraint is added to represent the designer’s imposition of a lower bound on the acceptability measure of the optimal design. § Now at the Nanyang Technological Institute, Singapore 2263.